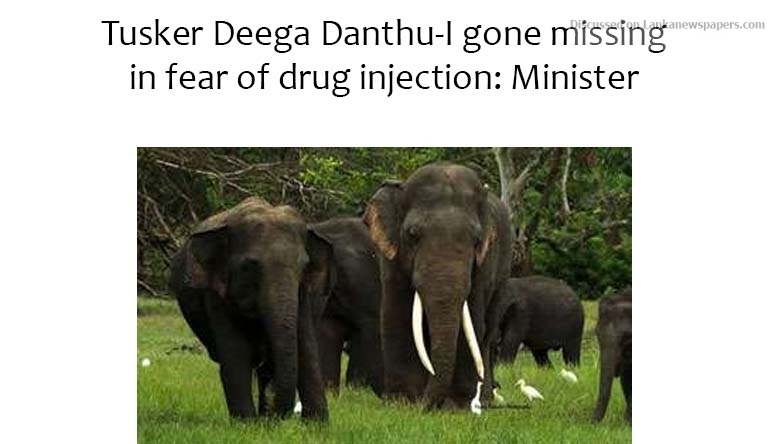 Nine teams led by 50 wildlife officers conducted a special search operation in the Kala Wewa National Park to locate the Tusker Deega Danthu-I which had run away in fear of drug injections after being found with gunshot injuries, Wildlife Deputy Minister Palitha Thewarapperuma today said. Speaking to the Daily Mirror the Deputy Minister said he had also joined the team in search of the elephant. “The team had gone into the forest reserve about 12 kilometres following the tusker’s footprints. The teams finally managed to locate the tusker at the upper forest area near the Wellagala temple in the National Park,” he said. He said he had requested Special Task Force (STF) to have 50 officers to join the search operation, but they had turned down the request. Meanwhile, Galkiriyagama Wildlife Warden D. Ranasinghe said all the teams went into the forest reserve last morning following the footsteps of the elephant. “The tusker could not be found after last Wednesday (20) and did not know what had happened to him and the operation was launched accordingly,” he said. “The Kala Wewa National Park owns a land area of 21,690 hectares. It is very hard to find the elephant in such a large forest reserve. Deega Danthu-I’s footprints have found mixed with more elephant footprints and it shows that the elephant must have joined a herd,” Mr. Ranasinghe added. He said a medical team would put the tusker under anesthesia and treat to its wound after finding him. The Deega Danthu-I, one of the elephants with the longest tusks roaming the Kala Wewa National Park, was found with gunshot injuries on June 11.